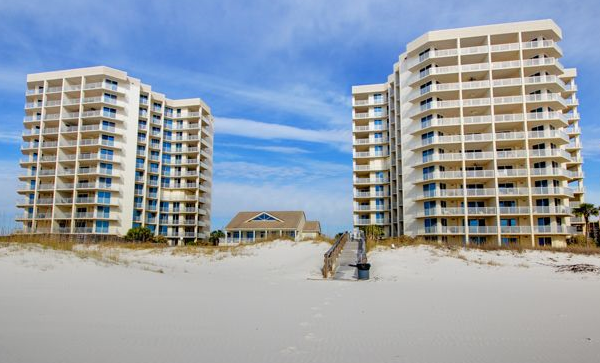 The best beachfront condominiums in Perdido Key on the Florida Panhandle provide the best of both worlds with gulf-front living overlooking the beautiful beaches of the Gulf of Mexico, many with deep-water boating facilities on Ole River. These beach properties includes covered parking space adjacent to the owner storage-closet and there is another storage-closet just outside the residence. This Perdido Key condominium complex features units with inviting living arrangement in a secluded area away from congested crowds but convenient to Orange Beach/Gulf Shores and Seville Quarter in historic Downtown Pensacola Florida. The Beach and Yacht Club at Perdido Key combines all the beauty of a gulf coast paradise with a warm atmosphere you'll embrace once you arrive. More than just a weekend get-away, the Beach & Yacht Club is a home - the design offers the privacy you'd expect in an exclusive resort, each floor includes four residences with spacious floor-plans, large gulf-front balconies with amazing views of the Gulf of Mexico.